2017 Taipei International Machine Tool Show (TIMTOS) will be grandly opened in TAIPEI Nangang Exhibition Hall, Hall 1, Taipei World Trade Center (TWTC) Exhibition Hall 1 and 3, and Yuanshan EXPO Dome at Taipei EXPO PARK from Mar. 7th to 12th next year. It is expected that about 1,045 exhibitors will use up 5,450 booths. Both numbers of exhibitor and booth hit record high, which shows an exhibition scale bigger than previous editions. 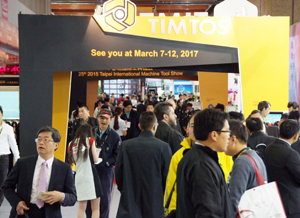 With growth in exhibition scale, around 7,500 foreign buyers and 47,500 domestic visitors are anticipated to come to visit, which again, it shows that TIMTOS is the best platform for buyers to come for purchasing latest machine tools and related products in Taiwan. 4.	International forums covering topics related to smart manufacturing, smart factory, machine tools application in automotive and aerospace industries. Although the global economy is facing a downturn at the moment, and Taiwan’s machine tools exports from January to July this year fell 16.3% compared to the same period last year, Taiwanese companies haven’t stopped for making improvement and continue to develop new technologies and products, in order to stand out from the competition worldwide. Exhibitors of TIMTOS are preparing to present their best and latest products in the show to provide buyers from home and abroad the best products and solutions, making TIMTOS a comprehensive platform that creates prosperous business opportunities. Come check out what’s in store from March 7 to 12, 2017!